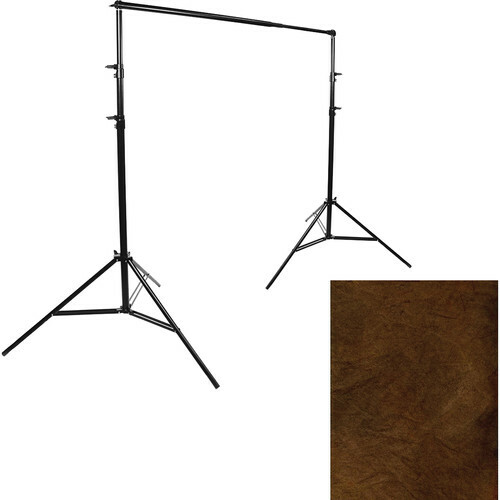 The Savage Port-a-Stand/Verona Muslin Background (10 x 20') is a backdrop support system plus a beautiful 10 x 20' muslin mottled background that lends a classical aura to any photograph. The Port-a-Stand consists of two 8'10" stands and a cross-bar to hold a background up to 10' wide. A carry bag is included. The Port-a-Stand weighs just 12 lbs (5.4 kg). The Verona Muslin Background is a one-piece medium brown 10' wide by 20' long, cloth background. The fabric drapes naturally, and there's a built-in 3" pocket at one end for hanging it from the Port-a-Stand. It's easy to clean with a damp sponge, and it comes with a carrying bag. It weighs 4.6 lbs (2 kg). Box Dimensions (LxWxH) 43.5 x 8.0 x 5.0"